Simon's Cat Dash - New Game on iOS and Android - Out Now! Simon’s Cat Dash is out now! We’re very excited to announce the global release of our new mobile game. An endless runner for iOS and Android, based on the popular YouTube series Simon’s Cat. Simon’s Cat is dreaming of a date with his love interest Chloe, but he needs butterflies to impress her, which is why he sets out on an adventure with his friends to chase down the butterflies! While you play the game you will dash through the garden, explore the house and the whole neighborhood. Time your jumps right to avoid obstacles and max your score. You will also have to look out for the hedgehogs and mice, who have laid traps for you and try to outrun the dogs, Oscar & Sir Royston, to complete the bonus stages and win big rewards. Finally show your friends who’s the big cat and work your way up the leaderboards. Who will run for the longest time? Not only can you play as Simon’s Cat and fan favorites Kitten & Chloe, but you can also unlock over 50 exclusive cats in crazy cat costumes and complete your cat collection. Simon’s Cat is the internet’s most mischievous cat and has become a global phenomenon. He’s the star of over 60 films, which have been watched over 870 million times, and winner of several major industry awards, Simon’s Cat has captured the hearts of a worldwide audience. If you’re not already a fan of Simon’s Cat, you will be soon! Share your high score with us! Follow Simon’s Cat Dash on Facebook to keep up to date with our latest news, tips & tricks, giveaways and seasonal content! 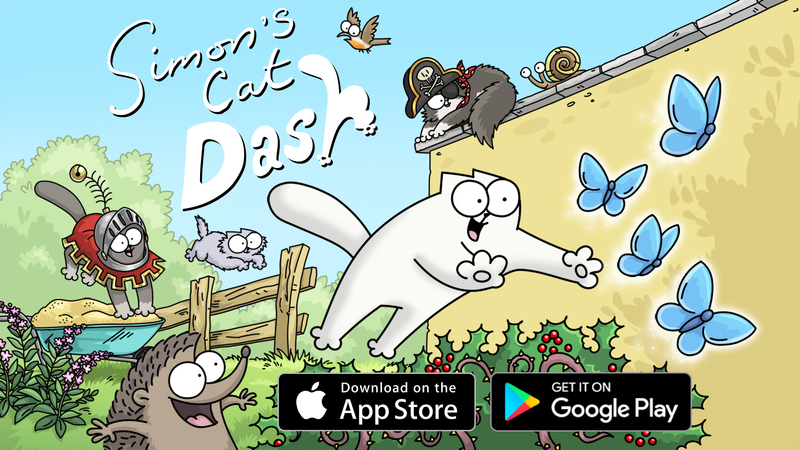 For more information on Simon’s Cat Dash, have a look at the game page.